A passion for classic Finnish travel posters is what drives us forward. Towards no man’s land where art and advertising meet. Towards travelling where the travel itself – and the dream of the destination – is the thing. But how did it all start? It is an ordinary day, the year is 2005, and Magnus is in downtown Helsinki window-shopping. Suddenly he stops. In the window there is an original poster from the 1930’s: A lady sipping champagne, in the background there is a classic Helsinki-tram. This is glamour. This is peace. This is tranquility. Magnus freezes and he realizes that his life has been predetermined: He is to become a poster hunter. He will find them all. Yes, he will become the author of the first Finnish book on travel posters. Back then he did not yet realize that the book would lead to a design company. 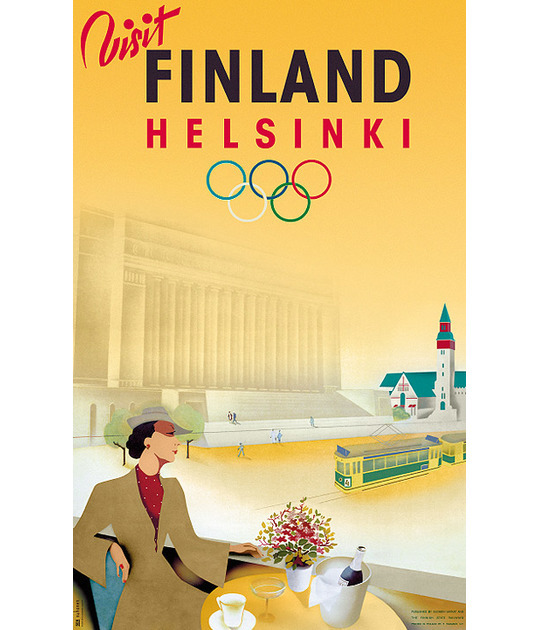 That we one of these days would be selling products with classic Finnish travel poster themes to the world. And that soon we would be doing the same thing in Sweden. Today we are a growing design company with the same burning passion: For travel poster art and for the artists.